You can now set up dates for your dog?? It's a Dog Meet Dog World. We’re a brand new way for dog owners and their dogs to meet new friends in their neighborhoods. Think of us as the OkCupid for dog playdates. Owners can arrange and join playdates, whether for finding matches for a quick stroll in the park or just meeting up with other dog owners and their dogs to play some fetch and sniff some butts. A NY entrepreneur who loves dogs and tech. We are a product-focused team and intend on using our efforts to first create a product that adds value to the lives of dog owners and their dogs. With that in mind, we have thought of certain business models that can help drive in revenue, besides the traditional advertisement model. PlayGroups are our version of Meetup groups but instead for the dogs. Anyone can choose to create a PlayGroup but we will only charge a monthly membership fee to PlayGroups with 20 or more owners. PlayGroups can be created based on location (e.g. Central Park dog lovers), breed-type (e.g. Chihuahua owners in NYC), or even size-based (e.g. Park Slope Teacups). We have also discussed our PlayGroup platform with many big brands including Petco and they have expressed interest in sponsoring many of our PlayGroups. The reason is our platform brings about an unique way for major pet brands to market in the dog run without actually explicitly posting advertisements everywhere. For this, we will charge a CPU rate. The human dating aspect of our platform has always been present since the get-go. Must Love Dogs is a film that resonates strongly (at least the part where her dates must be dog owners) with what we believe in as a team of passionate owners: that being a dog owner speaks volumes about your character and your personality. We believe that being owners in today’s world means living a certain type of lifestyle, a lifestyle which only other dog owners can fully understand and appreciate. Thus we have thought of a premium membership model for our single users who are interested in utilizing our social network to help them date and find their potential dog loving soul-mates. 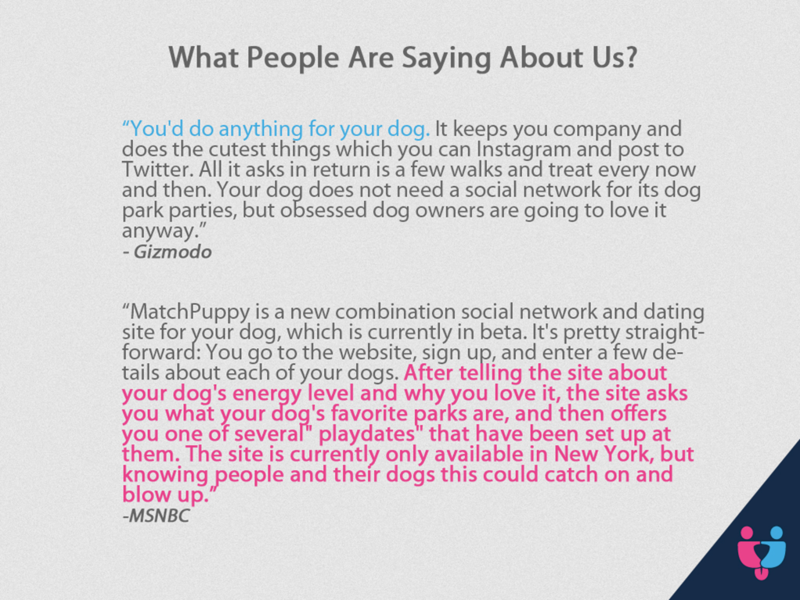 Furthermore, as we build MatchPuppy into the destination online to connect with other dog owners, we envision our brand and website becoming a “match” hub for all things dog-related. With this said, we are partnering up with certain dog companies providing services such as dog-boarding, finding dog-walkers, dog medication, and even online dog food sites to add value to our users and in-return we will help these brands through lead generation. In addition, we will be integrating a MatchPuppy PlayDate widget onto many of our partner sites to help with distribution and acquiring new users. Q: What is the problem you're solving? A: MatchPuppy was formed when I wanted my dog Louis (see above pic) to have more socialization with other dogs of his size and temperament. Problem with Louis was all the dogs at the dog park were huge compared to him and he was just a little guy and a bit overwhelmed at times. So I looked everywhere online to see if there was a way to arrange playdates beforehand, so the owners can filter out what kind of dogs they will be meeting up with. I even tried Meetup which has dog play-groups but the problem with Meetup was that the profiles were all about the humans, there was nothing about the dogs’ personalities or even a picture to see the dogs we we’re meeting up with. 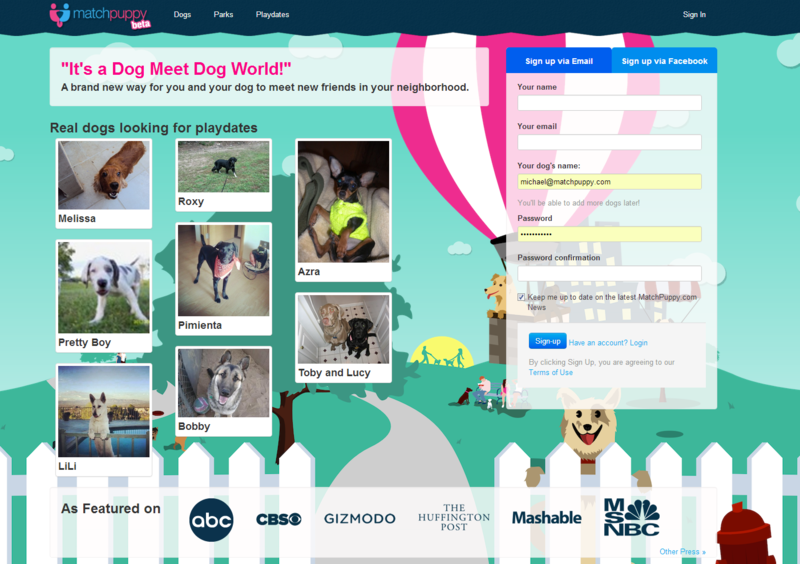 So after failing to find any suitable platform, I decided there was a gap in the market for dog owners who wanted to facilitate playdates over the web. 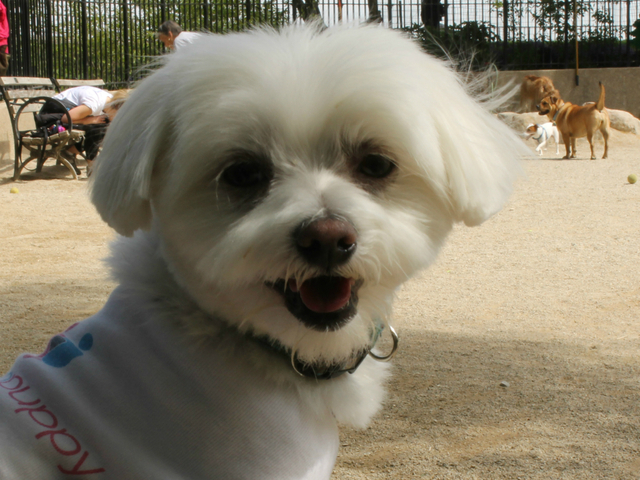 The entrepreneurial bug then bit and MatchPuppy was started to become the Meetup for dogs. As we started to gather validation from interviewing hundreds of dog owners in NYC, we realized there was also no platform unique for owners to share their dog's pictures and life-story over the web. 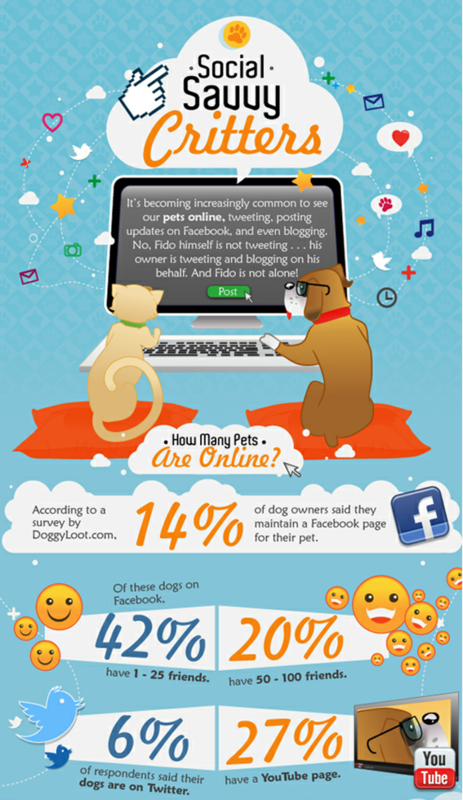 This is apparent as owners everywhere are creating fake Facebook profiles for their pets and even posting updates on Twitter as well as blogging about their daily adventures while on their walks. See the below survey by DoggyLoot.com. Q: So why exactly will people use MatchPuppy? Arrange and join playdates, whether for finding matches for a quick stroll in the park or just meeting up with other dog owners and their dogs to play some fetch or sniff some butts. Find new friends, whether romantic or platonic. Be able to connect with other owners met on the street and at the dog park. Have the chance to turn a random sniff of a passer-by into something meaningful for both human and dog. Share pictures, videos, stories and adventures of the owner and dog on a platform made unique to telling a dog’s story. Q: So is it a dating site for the dogs or for the humans? 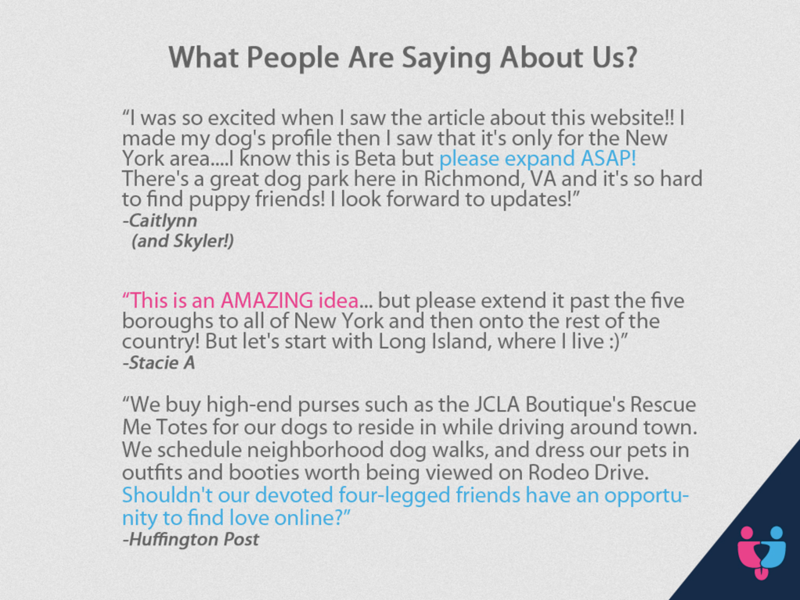 A: We like to think of MatchPuppy as the platform to find new friends for both you and your dog. It can be romantic but mostly our users have been using our site purely for finding suitable playmates for their dogs to play with at the park. An added benefit for the owner is to be able to go on a playdate and find another owner who shares similar backgrounds or interests and thus while the dogs are having a blast sniffing each other's butts, the owners too can share a good laugh and some good conversation. However, with this said, a portion of our users have inquired about the human dating end of our site. We strongly believe that b/c we're not marketing ourselves as a human dating site, our platform also provides an easy and low-key way of meeting other single dog owners. Currently, we do not have any human-dating feature but are in the works of developing an effective way of leveraging our platform to help all the single dog owners out there find their dog-loving soul mates. Q: How many users do you have on MatchPuppy? A: Since we launched our public-beta in February of 2012, we have acquired about 2600 users in NYC (anybody can sign-up but only NYC parks and playdates are shown), mostly through word-of-mouth and from some awesome press (*note: so far we have spent $0 on marketing and press). Since Feb, we have had about 250 playdates organized through our site with an average size of about 5 dog owners present at every playdate. A: We're currently raising a seed round to expand the team and hire another developer to work on our mobile app. Dogs are always on the go so it's crucial for us to provide the tools so our owners can keep up with them as well as be able to search for suitable playdates while out and on the prowl. We're also working on our dog-matching algorithm and will soon release our PlayDate Recommendation feature. The most well-known competitor to the services that MatchPuppy provides comes from Dogster.com. Though it interfaces with PetFinder, a pet adoption directory, no other pet-related site offers any sort of matching functionality or location-aware interaction between users. On the other hand, MatchPuppy not only creates a focused, dog specific social networking space but also provides a location specific space for owner networking and interaction. Also Dogster focuses more as forum for owners to share tips and advice on taking care of their pets while MatchPuppy adds the angle of dating and meeting up with others. And naturally, another close competitor to us is Meetup.com, which allows dog owners to set up meets for a variety of dog-related interests and purposes. 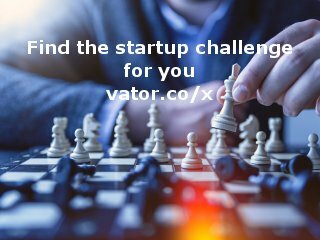 However, our venture goes beyond meetups by providing the social networking space where users can do all of the above, and at the same time connect with each other by sharing photos, videos, stories and adventures of you and your dog on a platform made unique to telling a dog's story. Besides these two main competitors, there are a number of websites out there that cater to a similar target market, but lack a significant customer base due to complicated and unwelcoming user interfaces. 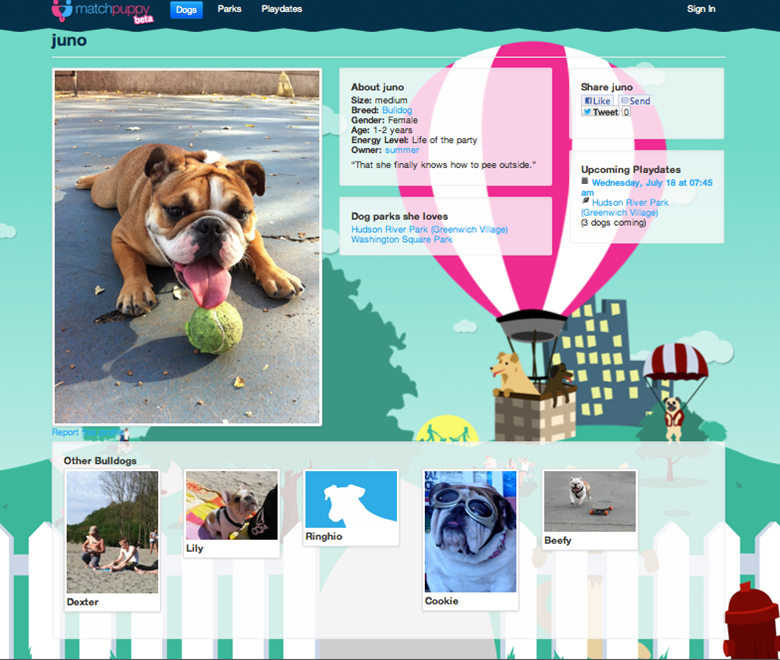 MatchPuppy recognizes and emphasizes the importance of aesthetics and simplicity of use. We are a team of passionate dog owners who want to create a product that dog owners would love to use. So with all this said, our main competitive advantage is our focus. We concentrate on the community and connecting people together aspect of the dog market. Picture this: two owners are walking their dogs down the street from opposite ends and as they approach each other their dogs start to sniff each other's butts and instantaneously there's this connection building between the owners. We at MatchPuppy want to help owners everywhere to turn this random sniff of a passer-by into something meaningful for both human and dog. MatchPuppy was featured in a VatorNews article: "Splash NY Dec 2012 Finalist - MatchPuppy"
MatchPuppy was featured in a VatorNews article: "Traxo has won Vator Splash NY!"